The brilliance of the Thicklip Gourami in full colors is indescribable, words can hardly do justice to its beauty! The Thick Lipped Gourami Trichogaster labiosa (previously Colisa labiosa) becomes a very handsome fish. Once it gets settled this beauty makes a very attractive addition to a community aquarium. The mature adult has a splendid rusty orange or brown coloration accented by turquoise colored fins with orange or red edges. The males are even more gorgeous with bold turquoise bands which run vertically along the body, especially towards the back. The term 'labiosa' in its scientific name means 'lip' and is referring to the thick lips of this fish, hence its other common name is Thicklip Gourami. It's a fantastic fish in its true coloration, but it has been further developed to bring out more of its orange. This color morph is not found in nature but has been selectively bred for the aquarium trade. This gold or ‘sunset’ strain has the barred patterning of the "true" form replaced by a uniform orangish red or gold coloration. This variety is also very stunning and the female is almost as colorful as the male. It is known as the Sunset Gourami or Sunset Thicklip Gourami, and sometimes is also called the Orange Thicklip Gourami or Golden Thicklip Gourami. This gourami is very closely related to the well known Dwarf Gourami Trichogaster lalius and the Banded Gourami Trichogaster fasciatus. In fact the natural color pattern of the Thick Lipped Gourami is so similar to that of the Banded Gourami, that the two are easily mistaken. Also because of the close relationship between the Thick Lipped Gourami and these other two, they can crossbreed. Selectively bred hybrids have produced even more new color patterns in golds, reds and greens, with the red hybrid being called the "Robin Gourami". These color morphs are often more available to the aquarist than the "true" form, possibly because they maintain their coloration better at the retailers. Whether as color morphs of individual species or as hybrids of two species, the number of color varieties selectively bred in captivity has created a lot of confusion. When selecting any of these fish it helps to know the scientific name as well as the common name. This is because common names are often applied rather indiscriminately, with different developed varieties often being called by the same name. A good example of this is the Sunset Gourami. Sunsets can be a color variation of the Thick Lipped Gourami T. Labiosa or the Honey Gourami T. Chuna, and also other fish can have a "sunset" color morph. This gourami is a Labyrinth fish, and as is characteristic of this group it must have access to the surface of the tank so it can breathe. They can still get oxygen by passing water through their gills, but they have an additional respiratory organ called the "labyrinth organ". Another characteristic is that of being a bubble nest builder, and this male seems to enjoy building his nest. He will build a nest so big that it can cover half of the aquarium surface. However the nest is fragile and he does not use vegetation in it, but to keep it stable he will build it under a leaf. Thick Lipped Gouramis are much hardier than most dwarf varieties and one of the easiest species of gourami to breed. This makes them great first fish for the beginning keeper. Once acclimated and comfortable in their own environment their truly beautiful colors begin to emerge. They have a great appetite and although they seem to prefer live foods, they are not picky about what foods they will eat. Being a peaceful fish makes them a good addition to a community tank but they can be a little timid, especially if housed with fish that pester them. These fish do well in a group or with other peaceful fish in a tank as small as 15 gallons. They like a planted aquarium so they have of places to hide. Ideally place plants along the back of the aquarium, have some floating plants, and leave open spaces in the front for them to swim. This species in its natural coloration is not as popular as other varieties. This is because few hobbyists have the patience to wait for the Thicklip Gourami's full colors, which are slower in coming. However those that do commit to the keeping this fish are greatly rewarded when males flush with their breeding colors. They are some of the most brilliant of the family! The Thick Lipped Gourami Trichogaster labiosa (previously Colisa labiosa) was described by Day in 1877. It is found in tropical South Asia where it is indigenous to Southern Myanmar (Burma) from the Irrawaddy, Sittang (Sittoung), and the Great Tenasserim River (or Tanintharyi River). It has also been introduced into Colombia, South America. Another common name it is known by is Thicklip Gourami. This species is listed on the IUCN Red List as Least Concern (LC) as it is widespread and there are no significant threats across its range. Most of these fish available in the trade today are commercially produced. It is very unlikely that wild caught specimens would be encountered for the aquarium. A paper by Myers in 1923 resulted in a taxonomic misinterpretation and at that time the generic name Colisa was adopted for the small western species of gourami, including this species. This interpretation has more recently come under review and the taxonomical structure revisited, and restructured. The result is that all the species which had been placed under Colisa have now been changed to Trichogaster as per Topfer and Schindler in 2009, and Tan and Kottelat in 2009. They are found in rivers as well as ponds, irrigation channels, and rice fields. The waters they inhabit are shady and slow moving, usually with lots of aquatic plants as well as floating vegetation. They are omnivorous in nature most likely feeding on small invertebrates, insects and other zooplankton. An interesting behavior, similar to that of the Archer Fish Toxotes spp., found in both the Trichopodus and Trichogaster species is that they have been observed catching their prey by squirting water. They do this by aligning themselves diagonally in the water to watch for prey above. Then with sudden contractions of their mouth cavity, they will squirt drops of water at the prey, knocking it off its perch into the water, where it is quickly snapped up by the fish. 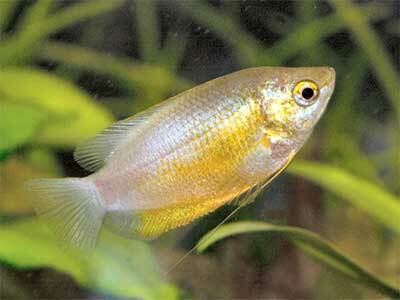 The Thick Lipped Gourami is somewhat compressed and roughly follows the diamond shape of the other gouramis. The fins are rounded and relatively large. The male will have a noticeably pointed extension of the dorsal fin. The pelvic fins are threadlike and extremely sensitive. This fish has a labyrinth organ, a part of the fish which allows it to absorb atmospheric oxygen directly into the bloodstream. It will reach almost 4 inches (10 cm) in length and has an average lifespan of 4 - 7 years with proper care. A selectively-bred golden or "sunset" strain has also been produced for a red or golden coloration. In these or all of the blue colors are bred out and a warmer and lighter body color of red, orange, or yellow is produced. It is known by several common names including Sunset Gourami, Sunset Thicklip Gourami, Orange Thicklip Gourami, and Golden Thicklip Gourami. These names, or combination of them, are also often used for color morphs of the Honey Gourami T. Chuna, the Dwarf Gourami T. lalius, and sometimes other dwarf species. They are used for hybrids as well, where the T. labiosa is crossed with either the Dwarf Gourami T. lalius or the Banded Gourami Trichogaster fasciatus. Some have tried to capitalize on the success of the sunset and sunrise gouramis by creating dyed versions of the two. The more benign version of the dying process simply involves feeding food laced with dyes. The superficial color of the fish quickly fades and as far as we know, the fish goes on to lead a more or less normal life. The other version uses the much more questionable, but equally temporary dye method referred to as painting, juicing, or simply dyeing. Pockets of liquid dye are believed to be injected with a large needle in multiple, perhaps dozens of sites, on the fish underneath the skin. There is strong evidence suggesting that the process is painful for the fish, causes decreased immune system function, and drastically shortens the life of the fish. While ultimately the decision is with the aquarist, they should be prepared to make an informed choice with their purchases. Lifespan: 4 years - Their average lifespan is 4 - 7 years with proper care. This is a hardy fish with a peaceful nature and makes as a good choice for the beginner. They are fairly easy to maintain and readily take most commercially prepared foods. They like warm water but are quite adaptable. Not being overly sensitive to water chemistry conditions, they can tolerate changes within reason. The Thick Lipped Gouramis are omnivorous, in the wild they most likely feed on on small invertebrates, insects and other zooplankton. They especially like live foods, but will adapt to other foods readily. In the aquarium these fish will generally eat all kinds of live, fresh, and flake foods. To keep a good balance give them a quality flake or pellet food as the base to the diet. Supplement this with live foods such as white worms, blood worms, brine shrimp, or any other suitable substitute. Fresh vegetables as well as vegetable tablets, like spirulina wafers, can be offered as well. Generally feed once or twice a day. These gouramis are hardy fish but the aquarist must provide a rigorous system of water changes. Although the labyrinth organ allows the fish to survive in oxygen depleted water, it is a common misconception that this makes water changes unnecessary. This is hardly the case as these fish will suffer the same tissue damage from built up toxins as any other fish. Regular water changes are a must with 25% weekly being recommended. The Thick Lipped Gourami will swim in all parts of the aquarium. A small group can be housed in a tank as small as 15 gallons. Larger tanks offer more space for plants however, and the water will be more stable. It is desirable to keep the tank in a room with a temperature as close as possible to the tank water, or risk damaging the labyrinth organ. The tank should have an efficient filtration system but should not to create too much of a current. Air stones are also recommended for these fish as they prefer well oxygenated waters. These gouramis will show their colors best on a dark substrate. They are timid fish and like a planted aquarium so they have of places to hide. Ideally place plants along the back of the aquarium, have some floating plants, and leave open spaces in the front for them to swim. As with much of the family, this species appreciates the cover of floating plants as well. However they will regularly breath air at the surface so its important to have some areas unencumbered with plants. Temperature: 72.0 to 83.0° F (22.2 to 28.3° C) - Keep the surrounding room temperature consistent with the water temperature to avoid causing trauma to the labyrinth organ. Breeding Temperature: 80.0° F - Breeding temperatures are between 80 - 84° F (26 - 29° C). The Thick Lipped Gouramis are generally good community fish but they are timid and slow-moving, so it may take a bit of time to become comfortable in an aquarium and come out of hiding. Once they are happily established the male's coloring will begin to show. Take great care when picking tankmates as very active or aggressive fish can easily intimidate them and often out-compete them for food. These fish are one of the more peaceful gouramis. They will display some hierarchal behavior, but aren't as aggressive as some of the other fish in the group. A small group of these fish that are about the same size should be able to live peacefully together. The ideal situation is to obtain a group of 5 or more youngsters and raise them together. Keep them in alone in their own tank or sharing a tank with some other calm, friendly species. They should not be mixed with fin nippers as their trailing pelvic fins and generally slower movement makes them a perfect victim. Territorial species such as many cichlids are best avoided too. Don’t keep it with its close relative the Banded Gourami T. fasciata, because although it is a distinct species these two can easily hybridize. They do best when kept them with other peaceful fish. Good tankmates are peaceful cyprinids such as the Harlequin Rasbora Trigonostigma heteromorpha and many of the other rasboras, danios, smaller Pethia, and Puntius species. Some of the peaceful barbs also work well, but avoid those that are notorious fin nippers like Tiger Barbs and Clown Barbs. Smaller loaches like the Kuhlii Loach Pangio kuhlii and its relatives, many of the Tetras, smaller catfish like Corydoras species and Otocinclus, and smaller Rainbowfish make great tankmates. Temperament: Peaceful - Though somewhat hierarchal, these fish are rarely violent towards each other or other fish in the community aquarium. Same species - conspecifics: Yes - They can be kept as a pair or in groups of 5 or more individuals. Peaceful fish (): Safe - These fish are very timid, so make sure to keep with less boisterous fish. Plants: Safe - These fish appreciate a well planted tank. These fish exhibit sexual dimorphism with the male becoming much more colorful when in breeding mode. The male will also have a pointed dorsal fin while the female's is noticeably rounder. The Thick Lipped Gourami is one of the easiest species of gourami to breed, but a separate tank is required. Like most fish in this family, it is a bubble nest builder. A pair will be most likely to spawn if there is a fair amount of plants, a good sized surface area, and the temperature is to their liking. For a couple of weeks prior to spawning the pair should be separated. During this time they need to be well conditioned with small offerings of live and frozen foods several times a day. When well fed, females should begin filling out with eggs, appearing very plump. Provide a breeding tank, either 10 or 20 gallons works fine. The water should be shallow, with about 5" (13 cm) being ideal. Water parameters should be about 8° dGH and the temperature between 80 - 84° F (26 - 29° C). It's not necessary but you can add a small gently air-powered sponge filter or some peat filtration, however the tank current should be minimal. They need plenty of floating plants and/or stem plants grown to the surface. Cover the tank well to keep the air above the water warm and humid, to help prevent damage to the labyrinth organ. Introduce the female to the breeding tank a couple of days before the male, then introduce the male. The male will build a big nest that can cover half of the aquarium surface. However the nest is fragile and he does not use vegetation in it, but he will build it under a leaf if available. Once the nest had been built the male will begin a courtship display to entice the female to spawn. He will swim back and forth, flaring his fins and raising his tail until the female allows him to wrap his body around hers. As the female releases her eggs the male will immediately fertilize them. The male will pick the eggs up in his mouth and put them in his bubble nest. The pair will then spawn again until about 500 eggs are produced. The female must be removed at this time as the male will fiercely guard the nest and eggs. He will continue to tend the nest and guard the eggs until they hatch. The eggs will hatch in about 24 - 36 hours, depending on the temperature. After about 2 - 3 more days the fry will become free swimming. This is when the male should be removed or he might eat the fry emerging from the nest. Free swimming fry can be fed infusoria or a liquid fry food until they are large enough to eat baby brine shrimp. See the description of breeding techniques in: Breeding Freshwater Fish: Anabantoids. 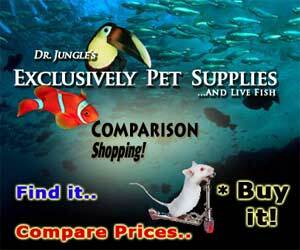 Also see Fish Food for Fry for information about types of foods for raising the young. Ease of Breeding: Easy - A separate breeding tank is required. Thick Lipped Gouramis are very hardy so disease is not usually a problem in a well maintained aquarium. Some diseases they are prone to are bacterial infections, constipation and Hole in the Head if good water quality, nutrition, and maintenance is not provided. With any additions to a tank such as new fish, plants, substrates, and decorations there is a risk of introducing disease. It's advisable to properly clean or quarantine anything that you want add to an established tank prior to introduction, so as not to upset the balance. These fish are resilient but knowing the signs of illness, and catching and treating them early makes a big difference. An outbreak of disease can often be limited to just one or a few fishes if you deal with it at an early stage. The best way to proactively prevent disease is to give your fish the proper environment and a well balanced diet. The closer to their natural habitat the less stress the fish will have, making them healthier and happy. A stressed fish will is more likely to acquire disease. For information about freshwater fish diseases and illnesses, see Aquarium Fish Diseases and Treatments. The "true" Thick Lipped Gourami in its natural form is usually available in stores and online, however it is not seen as regularly as the Sunset Thicklip Gourami variety, but both are reasonably priced.